Remember, if you can, a time when there weren’t post-apocalyptic films to satisfy our morbid curiosities. A desolate version of everyday life is a fascinating idea and it’s why almost every possible variation of the concept exists. So when distinctly silent and horrific A Quiet Place was released last year, there was just cause for its buzz and acclaim as it centered around an intriguing premise and a talented team. Eight months later, Netflix released their own sensory-based end-of-the-world flick, poised to be a hit for similar reasons. But Bird Box, unlike its counterpart, never quite reaches the potential of all its creative pieces. Instead, it’s simply an enjoyable two-hour stream that commits itself to entertaining, shortly before fading from memory. 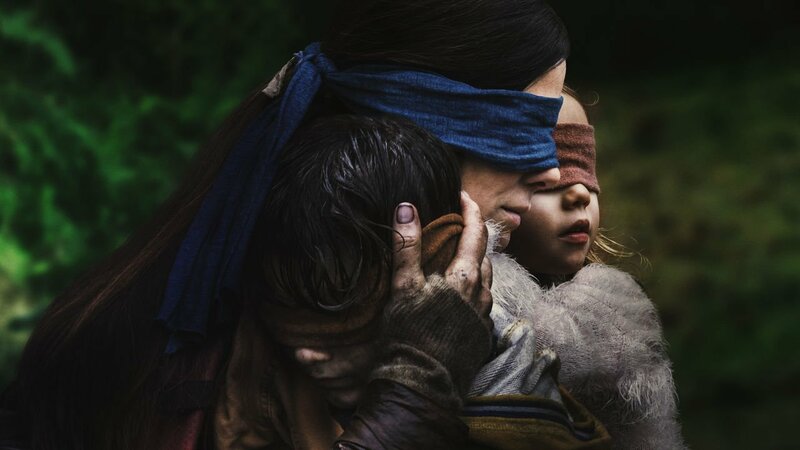 Directed by the award-winning filmmaker Susanne Bier (In a Better World), Bird Box — an adaption of the Josh Malerman novel — explores a world where humans are forced to commit suicide after looking at invisible, supernatural entities. Writer Eric Heisserer puts Sandra Bullock through her paces as the weary Malorie, a mother blindly guiding her two children — Boy (Julien Edwards) and Girl (Vivien Lyra Blair) — across a wasteland in the pursuit of sanctuary. Intercut with the family’s flight are flashbacks to the initial contact with the creatures, explaining the circumstances that led them to attempt the journey in the first place. Sandra Bullock (Left) and Sarah Paulson. Photo: Netflix. The flashbacks, taking place five years earlier, show a despondent Malorie resisting her pregnancy and ignoring encouragement from her charming sister Jessica (Sarah Paulson). Before long, the outbreak of the rampaging entities forces Malorie to seek refuge in a stranger’s home; there she joins a group of strangers portrayed by a talented and diverse cast: John Malkovich is Douglas, the token paranoid, self-centered survivor; Trevante Rhodes of Moonlight plays Tom, a sympathetic veteran; and Danielle Macdonald is Olympia, another expecting woman whose warmth starkly contrasts with Malorie’s bluntness. Rounding out the eclectic group include underused BD Wong and Jacki Weaver, with a later addition of Tom Hollander as the mysterious Gary. Like A Quiet Place, the post-apocalyptic world of Bird Box is intriguing, unique, and fully-realized: windows are covered, ropes guide and connect the blinded — even birds have an unusual utility as alarms, loudly chirping when the unseen forces are near. But despite the sight-restricted barren setting and skilled supporting roster, there aren’t enough opportunities to take advantage of either since plot devotes most of the running time to hiding indoors. In the film’s standout scene, a group of survivors drive to a supermarket using a tinted vehicle’s GPS and proximity sensor; the suspenseful sequence offers a glimpse of what could’ve been if the premise was fully-capitalized on. There’s much to be desired by Oscar-nominated Heisserer. By the end of his script for Arrival, a science-fiction drama in which an invading alien race attempts communication with an expert linguistic (Amy Adams), viewers are presented with a poignant sci-fi story that explains the important whys and hows — the same can’t be said for the screenwriter’s follow-up. Beyond bits of exposition, Bird Box follows the don’t-think-about-it style of storytelling. Why don’t the creatures ever go inside buildings? Don’t think about it. What motivates them to whisper at humans to look at them? Don’t think about it. The list of never addressed questions goes on. A half-explanation is given by supermarket employee Charlie (Lil Rel Howery) about the nature of the murderous beings, but that answer, just like the preference for vagueness, is unsatisfying as it is meaningless. Vivien Lyra Blair, Bullock, Julian Edwards. Photo: Netflix. If one film-defining theme had to be highlighted from Heisserer’s script, it’s the motherhood arc Malorie not-so-subtly undergoes. Bullock shines as a desperate parent trying to save her children from a bleak environment occupied with invisible monsters and deranged humans unaffected by their suicide-inducing abilities. Echoing her performance in Alfonso Cuarón’s Gravity, Bullock rises above her restrictions — including being blinded and acting frequently alone (since her blindfolded children rarely speak) — to portray a woman who gradually embraces what is important to her over the course of the trek. Danish director Bier’s generally competent direction is an occasional double-edged sword, positioning Bullock to impress but also hindering her with editing choices. While John Krasinski, helmer of A Quiet Place, embraces his film’s horror casing with a foreboding atmosphere that slowly crescendos to an explosive climax, Bier is more impatient, cutting scenes short and switching to point-of-view blindfolded shots to speed up the pace, ultimately devoiding built-up tension in several sequences. But most of these grievances will surely be lost on Netflix’s ears considering the coverage the film has generated since release. For them, Bird Box is a hyped post-apocalyptic thriller whose gripping lead anchors its two-hours. And to be fair, Bird Box, without a doubt, is a fun movie. But for post-apocalyptic fans desiring a film that pushes the genre forward — be advised: eyes should remain open and searching elsewhere.